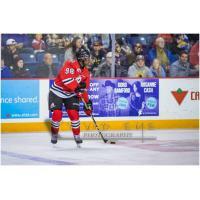 The Niagara IceDogs fell to the Sudbury Wolves in a close 3-2 battle in their third home game of the season. Kyen Sopa tapped in an Ivan Lodnia shot to score the first of the game in the first period. The second assist went to Johnny Schaefer. Sudbury evened it up, and a few minutes after, scored on the powerplay to make it 2-1. A quarter of the way into the second, Kirill Maksimov scored. The goal was assisted by Ben Jones, continuing Maksimov's and Jones' point-per-game streak this season. There was some 4-on-4 action before going on a powerplay towards the end of the second. In the third period, Sudbury scored the last goal of the game just off the powerplay to make it 3-2. The Dogs dropped this one, but are back in action tomorrow night in Mississauga against the Steelheads.